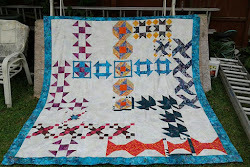 Jean's Quilting Page: Tumbler Explosion! 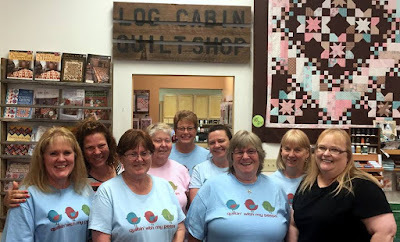 During Saturday's Tumbler Quilt class, everyone relaxed and had fun. Some were even exchanging tumblers as everyone made theirs scrappy. I didn't end up doing any sewing Sunday, though I did work on some quilting related things. I also went shopping for awhile, which was fun. I got a new purse, among other things. Yesterday it was back to work....but it is easier going this week, knowing that we have next week off! Spring break...oh yea! I have so many things planned to do next week, that I may need an extra week to get it all finished! I am teaching a Sampler Club class tonight and have a few models to hang for other classes, so I plan on going to the store right after work. A couple of the ladies in that class were in Saturday's class, so I hope to see more finished Tumbler Quilts! Beautiful, beautiful, BEAUTIFUL! 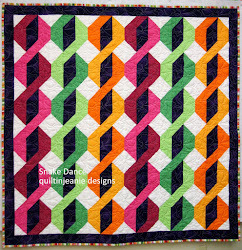 Love all those scrappy tumbler quilts! 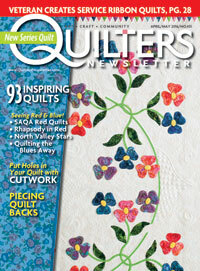 Such Happy quilts... I love them. LOL Looks like fun. Deb's Round Robin and the animal border is on! The round robins go home!